The Old Point Loma Lighthouse stood watch over the entrance to San Diego Bay for 36 years. At dusk on November 15, 1855, the light keeper climbed the winding stairs and lit the light for the first time. What seemed to be a good location 422 feet above sea level, however, had a serious flaw. Fog and low clouds often obscured the light. On March 23, 1891, the light was extinguished and the keeper moved to a new lighthouse location closer to the water at the tip of the Point. Today, the Old Point Loma Lighthouse still stands watch over San Diego, sentinel to a vanished past. The National Park Service has refurbished the interior to its historic 1880s appearance – a reminder of a bygone era. Ranger-led talks, displays, and brochures are available to explain the lighthouse’s interesting past. Construction – Why is it the "Old Point Loma Lighthouse?" 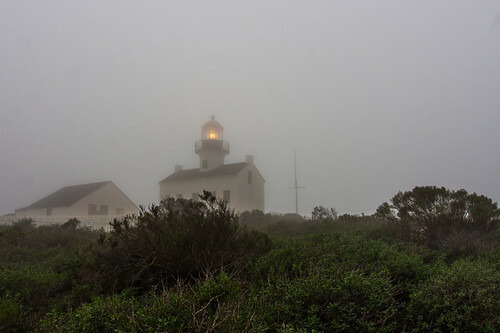 The Old Point Loma Lighthouse is a reminder of simpler times – of sailing ships and oil lamps and the men and women whom day after day faithfully tended the coastal lights that guided mariners. In 1851, a year after California entered the Union, the U.S. Coastal Survey selected the heights of Point Loma for the location of a navigational aid. The crest seemed like the right location: it stood 422 feet above sea level, overlooking the bay and the ocean, and a lighthouse there could serve as both a harbor light and a coastal beacon. Construction began three years later. Workers carved sandstone from the hillside for walls and salvaged floor tiles from the ruins of an old Spanish fort. A rolled tin roof, a brick tower, and an iron and brass housing for the light topped the squat, thick-walled building. By late summer 1854, the work was done. More than a year passed before the lighting apparatus – a five foot tall 3rd order Fresnel lens, the best available technology – arrived from France and was installed. At dusk on November 15, 1855, the keeper climbed the winding stairs and lit the oil lamp for the first time. In clear weather its light was visible at sea for 25 miles. For the next 36 years, except on foggy nights, it welcomed sailors to San Diego harbor. 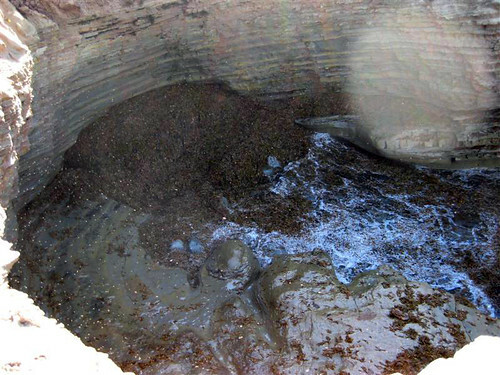 A cave formed by the waves of the Pacific crashing against Point Loma. Filled with seaweed.